Disclaimer: The Westone Wx sent to us for the purposes of this review is a sample and does not have to be returned. Thank you to Westone UK retailers Hifiheadphones for giving us this opportunity. Well most of us who’ve been in the audio game a while know Westone quite well for their flagship earphones, they were established in 1959 by Ron Morgan and have grown ever since. 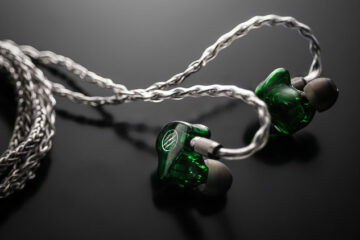 Typically, Westone is known for their high-end earphones, custom monitors, and hearing solutions today. However, they are taking things in a new direction with the Wx. 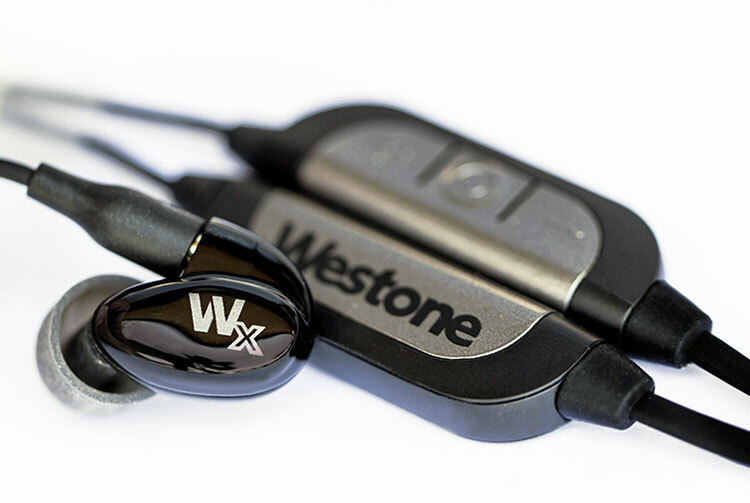 Westone has decided to join the growing Bluetooth or wireless IEM market. There are a ton of cheap products out there which do a similar job of music delivery and battery life. However, not many have the finesse and finish of a high-quality product. The Wx is a premium Bluetooth set of buds but do not let the simple box fool you because they sound the part. Not only do the earphones work great, Westone is also including a semi-universal accessory out the box allowing you to swap the Bluetooth cable with other earphones that share an MMXC port. The cable is also available for purchase separately in case you fancied giving that a go without the earphones. Build quality feels great. They have done a stellar job smoothing all the plastics and ensuring the housing is sealed tightly since BT Cable is certified to IPX4 sweat/water/dust resistance rating. The same with micro-USB connector where the rubber flap tightly seals the port opening to protect it from moisture. The overall design is something we’ve been used to for many years. The only new addition here is the cable. The shells are encased in a black shiny plastic with bold silver letters reading “Wx” written on the outside housing. 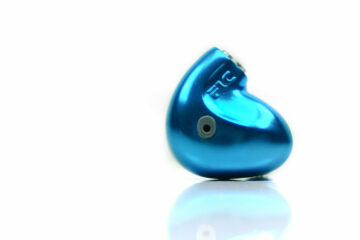 Each earpiece is marked with left and right indicators on the inside of the shell written largely in silver font. This is something I wish more manufacturers would do. Whilst I understand it’s not the most aesthetically pleasing it is practical when using earphones like these. The Wx are naturally very small which make them great for all types of ears. However, I have found them to be a little tricky getting a good seal without the correct ear tips. It was fortunate that the included silicon ear tips on the device will be perfect and not need changing. I still tried the other provided and it was virtually impossible to get a seal as good. Getting a good seal on these earphones is imperative for getting any sort of solid sound out of them. I cannot express this point enough. Without a decent seal, they sound shrill, anemic and virtually unlistenable. Thankfully, once you get past that caveat the comfort levels are great. They fit snugly within the concha of the auricle which is the bowl shape within your ear. Ergonomics are great from a technical standpoint, however, I can see a few people finding them a little tricky when first inserting them and finding their perfect fit. The cable design feels durable but comes at the cost of some flexibility. The wire is flattened probably to reduce the likelihood of tangling. However. with such a small amount of wire I would have rather seen the rigidity taken away in consideration of something a little suppler. The cable on the back is narrow and flat for a more comfortable fit as it goes behind and around your neck. There is the addition of a cable cinch too which seems a tad superfluous as the cable is fine without it however it is important to get a good fit universally. 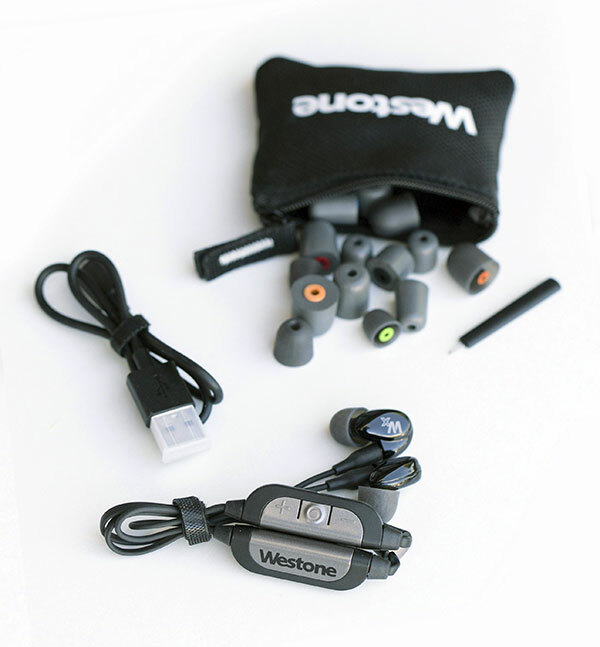 One of the best features of the Westone Wx wireless earphone is that it is detachable. This means you can replace it with any suitable MMCX style cable including a standard 3.5mm wire. The MMXC connector is light, snappy, and secure and works with almost all other earphones that used this type of connection making it a great accessory along with the headphones themselves. Westone is also offering the BT cable as a separate purchase to the earphones themselves. This essentially what makes the Wx earphone a Bluetooth earphone. The wire consists of two MMXC pins, a silver and black battery housing unit, as well as a silver and black control module. It’s a sleek design offering symmetry and modest looks but more importantly works well. The housing is made of high impact plastic with an aluminum matte plate over the top. On one side of the unit are functional controls which hosts an in-line remote with Vol +/- (also doubles as track skip), Power/Play/Pause/Call multi-function button, micro USB charging port, and a mic pinhole. The other piece merely contains a battery. 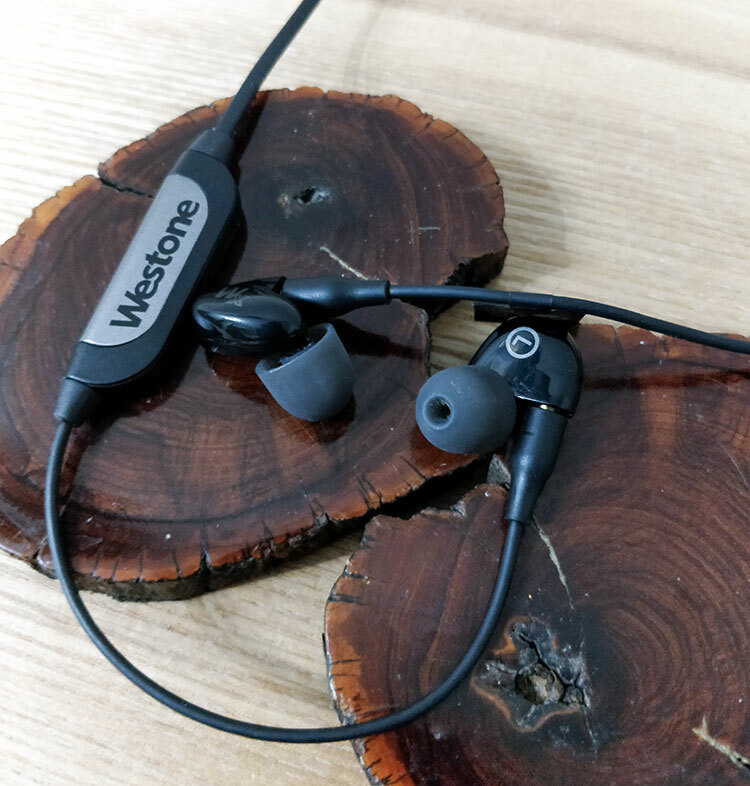 Westone did some prototypes of the design and finally managed to cut the weight down to 12g and get a decent 8hr playback which I can confirm is more than accurate from my testing. The LED is located between the Power and Vol- buttons, shining through a slit opening. It’s bright and multi-colored (blue and red), but to see it you must be sure to press the Power button with your thumb resting across Vol+ button so you don’t cover Vol-. The LED indicator is important because it shows power status, pair up status, low battery notice, and charging status. Connecting to the Westone Wx is easy enough. Simply hold down the middle button on the inline control and you’ll engage Bluetooth pairing mode. Then find it in the Bluetooth section of your smartphone or player and select Westone Wx. There has been minimal signal drop since using the product however sometimes when walking around with them I did notice crackles probably due to RF interference. The Westone Wx wireless earphone offers a 30ft range from the source and I can confirm with using my Oneplus 5T this turns out to be accurate as I got to about 30ft before experiencing any dropouts. Built-in to the Bluetooth standard is a protocol for Hi-Res audio called the aptX audio codec. The aptX codec allows lossless and Hi-Res players to stream audio via Bluetooth without compromising the sound. The result is crystal clear audio because the signal sent is the same audio you’ll receive with the Westone Wx wireless earphone. This works incredibly well with my Oneplus 5T through use of Qualcomm inbuilt aptX codec software. The Westone Wx promises up to 8-hours of continuous battery before it needs to be charged. I am very pleased to say so far this has been fairly accurate. In fact, I would say due to me not having 8 hours to continually use them I’ve had closer to 10 hours switching them off with about 40-minute listening breaks. Charging time from empty was 2hr on the do. When charging, the LED will show a red light. Once fully charged the indicator will change from red to blue. I can’t complain, I think they’ve provided a great array of accessories to try and accommodate every user.